To kick off Volunteer Appreciation Week, we are excited to celebrate Nolan Manning as our Volunteer of the Year. 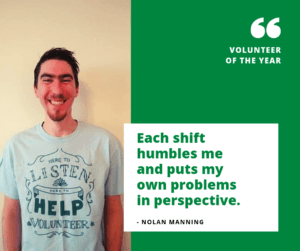 At our Volunteer Appreciation Night on April 4, we were proud to honor Nolan with this award for his incredible dedication to youth and families in crisis across the nation. When Chicago faced the Polar Vortex with subzero weather, Nolan still came in to our crisis services center to provide critical support to youth in need. His compassion and empathy provides each person who connects with him on the lines a safe place to explore the issues they face whether it be bullying, abuse, or homelessness. Nolan was even recently featured in the Lake View Patch! Thank you Nolan for all that you do! In celebration of Volunteer Appreciation Week, follow us on Facebook, Twitter and Instagram as we will be highlighting more of our amazing team of crisis liners throughout the week! Click here if you are interested in becoming a liner at the National Runaway Safeline.